"Plaid Shirt Guy" interviewed on CNN after Trump rally. RE: "Plaid Shirt Guy" interviewed on CNN after Trump rally. Where The State uses intelligence services to spy on the people. That's not Trump's fault; the deep state made him do it. He's just a senile elderly dude. secret service interrogated him for an hour for the treasonous act of not clapping Chancellor Trump. Can't make this sh*t up! This is the effect Trump has on his own supporter. 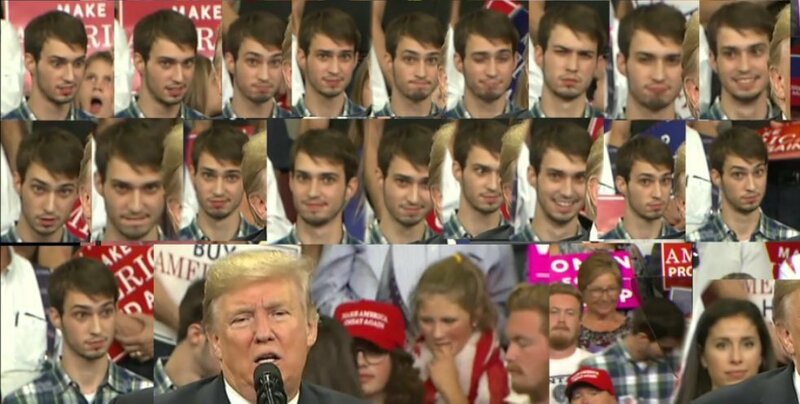 A man in a plaid shirt was replaced seemingly after he made a series of animated facial expressions as the president spoke. On Trump's America you WILL BE rounded up if you get caught making faces suggesting you just woke up from the trumpcult trance. Trump is secretly building Gulag prisons for everybody who refuses to clap and cheer him. Obviously the trumpcult sorcery doesn't work on him. The yawning blonde to his left is doing the color commentary. Home of freedom and rights, unless your aborigine. Then people like op beat you, spit on you, call you despicable names and tell you to go home or go away. People like op are so understanding in Australia, they deserve something special.